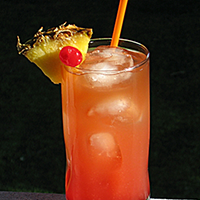 In an ice filled Collins glass, add (in order) the Spiced Rum, Coconut Rum, Pineapple Rum, Pineapple Juice, Triple Sec, Grenadine, and lastly, float the Amber Rum on top. You can stir if you like, but I really enjoy the layered flavoring by leaving it as is. Garnish accordingly, insert a long straw, and get ready to enjoy a tall, cold, taste of the tropics with your... Backseat Becky. Bottoms up!